That’s how Jacques Morin affectionately called Wing Commander Lucien Joe Lecomte. He told me so when I met him last year at his home. He did not have this picture. I found it on the Internet. Who is Joe the C. O.? – Award effective 2 October 1944 as per London Gazette dated 13 October 1944 and AFRO 2637/44 dated 8 December 1944. Born 1917 at St.Theodore d’Acton, Quebec; home in Acton Vale, Quebec (university student). Enlisted in Montreal, 9 October 1939. Commissioned October 1939. Flying instructor before going overseas in 1943. Commanded Nos.425 and 415 Squadrons and Base Tholthorpe. Remained in postwar RCAF; commanded Camp Borden, 1949-1951, and Station Trenton, 1951-1955. Service also included NATO duties and command of Nos.423 and 432 Squadrons. Retired December 1966. Died at St.Bruno, 18 December 1975, age 59. No citation other than “completed…numerous operations against the enemy in the course of which [he has] invariably displayed the utmost fortitude, courage and devotion to duty”. DHist file 181.009 D.1633 (RG.24 Vol.20603) has recommendation dated 28 July 1944 when he had flown 21 sorties (122 hours five minutes), 15 February to 21 June 1944. From the time of his arrival on No.425 Squadron, Wing Commander Lecompte has shown exceptional aggressiveness, courage and fine offensive spirit which have been an example and goal for all members of his squadron. Wing Commander Lecompte tackles all his work with vigour and has spent many hours in the air on training each captain of his squadron. That this has paid dividends is evidenced by the fine operational record attained by this squadron during the past months. In June his squadron was awarded the Base Pennant for all around efficiency. Wing Commander Le Compte’s organization of ground training, and constant and diligent attention to all phases have been of the highest order. He is untiring in his efforts to press home to all crews by personal lectures, points of airmanship which he has learned over years of experience. 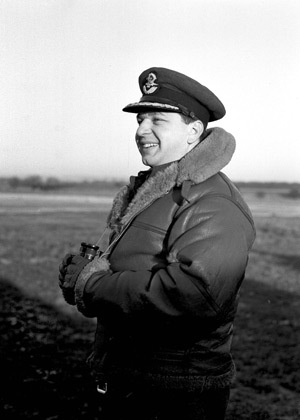 In addition to ground duties, Wing Commander Lecompte has operated on 21 sorties since February 1944 over targets in Germany, France and Belgium, including Berlin, Schweinfurt, Essen and Stuttgart. His fine offensive spirit and keenness for operations has kept the morale of his squadron at a very high level. In recognition of this officer’s devotion to duty and fine leadership I recommend the award of the Distinguished Flying Cross. [G/C J.L. Hurley, CO Station Tholthorpe]. – Mention in Despatches – Station Tholthorpe – Award effective 1 January 1945 as per London Gazette of that date and AFRO 337/45 dated 23 February 1945. – Mention in Despatches – Station Tholthorpe – Award effective 1 January 1946 as per London Gazette of that date and AFRO 322/46 dated 29 March 1946. AFRO gives unit only as “Overseas”; unit found in McEwen Papers list of recommendations for MiD. – Croix de Guerre with Silver Star (France) – Award as per AFRO 485/47 dated 12 September 1947. Pilot. All my articles on him on my blog written in French about 425 Alouette. About what I wrote on Joe the C.O.